On completion of an extensive surveillance, monitoring and evaluation of the current outbreak of conjunctivitis on island, the Ministry of Health (MOH) on 14 September advised education officials, that in an effort to contain and prevent the spread of viral conjunctivitis (Red Eye) all persons affected should remain at home. Health officials say given the seriousness of the outbreak among children, parents and guardians should be vigilant and ensure that every precautionary measure is taken to prevent their child from becoming infected and or spreading the virus. The MOH is also advising the general public to adopt similar measures to prevent the spread of the virus, while the Epidemiology Unit continues to evaluate the situation. According to health officials, within the past 48-72 hours there were significant increases in the number of reported cases of the syndrome and as a result, health practitioners have been responding quickly and adequately to the situation. Chief Medical Officer Dr George Mitchell, reconfirmed earlier reports that the current outbreak is viral and can be transmitted by person to person. Mitchell reiterated that the most practical and effective way to stop the spread of the virus, is by practicing proper and regular hand washing. He further added that persons should also refrain from touching or rubbing their eyes following contact with potential contaminated sources. 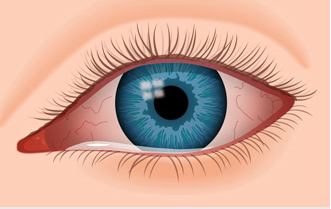 Outbreaks of viral conjunctivitis occur mainly in tropical countries with high population density, hot and humid climate. For additional information about conjunctivitis, clinical description and how it is spread, and how best to prevent and or manage conjunctivitis please visit www.cdc.gov or www.health.gov.gd.